Railpictures.ca - Dave Burroughs Photo: Half of the Tempo units are at Spadina in this 1968 view. A total of six RS-18′s were rebuilt for Tempo service and equipped with HEP. Hawker-Siddley built 25 cars for the Tempo service. CN ran 4 trains per day from Toronto to Windsor and one train per day from Toronto to Sarnia. When CN rebuilt these units, they were painted in the green and gold scheme and operated in regular service for some time before being repainted into Tempo colours. To see an example of a Tempo before Tempo, see this picture of CN 3887. | Railpictures.ca – Canadian Railway Photography – photographie ferroviaire Canadienne. 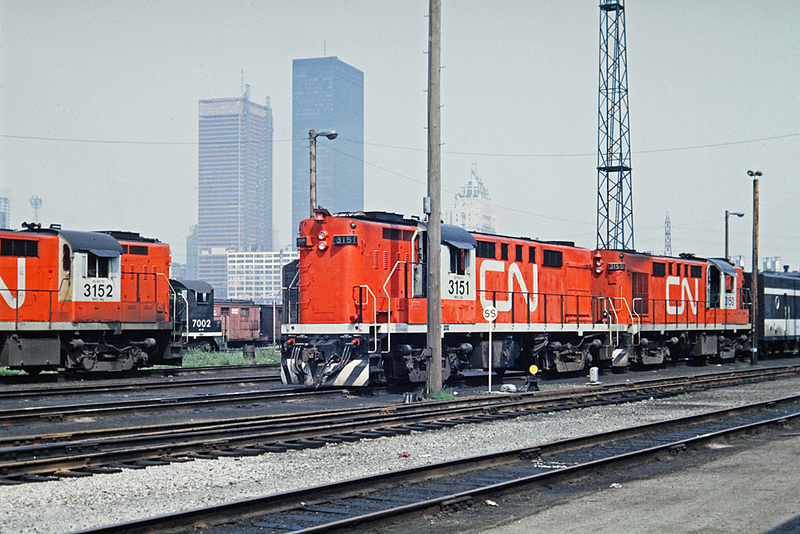 Caption: Half of the Tempo units are at Spadina in this 1968 view. A total of six RS-18's were rebuilt for Tempo service and equipped with HEP. Hawker-Siddley built 25 cars for the Tempo service. CN ran 4 trains per day from Toronto to Windsor and one train per day from Toronto to Sarnia. When CN rebuilt these units, they were painted in the green and gold scheme and operated in regular service for some time before being repainted into Tempo colours. To see an example of a Tempo before Tempo, see this picture of CN 3887.